They say it is unlucky to have thirteen for dinner. It seems to be in the case of Charles Cartwright, the actor. 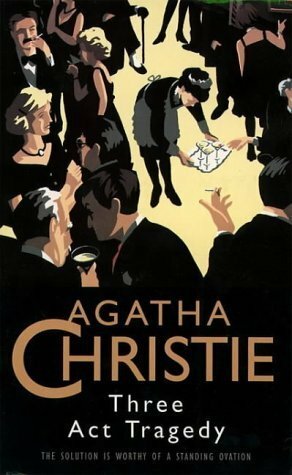 He is in the midst of mixing cocktails and handing them round, when the Reverend Babbington chokes on his and dies right there in front of everyone, including Hercule Poirot, rather handy when there is a dead body to contend with. Surely the cocktail glass should be analysed and then the truth of the matter will be known. But the cocktail glass contained nothing but the cocktail. No case for murder here. Then a few weeks later, another dinner party, another death and some of the same dinner party guests. Surely now the first death has to be related? And so Charles Cartwright embarks on his own case to solve and Hercule Poirot merely sits in the background, and thinks, observes and then comes to the only obvious conclusion and so the curtain falls on another Agatha Christie novel. Christie, structures her novels well and different, I don’t think there are any similarities here to her others. In this case, as Charles Cartwright, the main character and the host of the first dinner party where the first death occurs, the first act. The second murder opening the second act, and obviously the conclusion and the denouement in the third and final act. A play for readers if you will. All Christie’s books are good reads showing skill in crime writing; some are better than others but I would put this one in the better department. I came to this book after watching again the television adaptation. Now I will be honest, from the programme I knew who had done it fairly quickly on in proceedings. Mainly down to my late grandfather’s theory which probably holds up 99% of the time. If there are three famous people in the programme, one is the detective, one is murdered it stands to reason that the other one was the murderer! In this case it was true. I say no more, it is up to you to do the research. However, in terms of how true it stays to the book, is quite clear. In the book Poirot is a mere secondary character to be honest, and the main bulk of the investigating goes to a Mr Satterthwaite. On television, he is removed from the story line and this is how Poirot fits in far more. Other than that, I could not see any glaringly obvious moves away from the truth of the book. Somebody else was watching… A little man with an egg-shaped head and very foreign looking moustaches. “Now where have I seen that particular shape head before?” The owner of the head was sitting on a seat gazing thoughtfully ahead of him. He was a little man whose moustaches were out of proportion to his size. A great actor does not cease to act because he is not on the stage any more. I think for my next Christie book I need to pick one which I have not seen the television programme for? Great review, thanks! I haven’t got to this book yet in my Great Agatha Christie Challenge (http://www.fennellbooks.co.uk/christie/) although I have seen the TV adaptation which I didn’t like very much. I like your Grandfather’s whodunnit theory! Thanks for stopping by my blog. I see you are based in Hampshire, great to know there are other voracious readers in the county.